Travel hasn’t changed much in 60 years. We’re still taking planes, trains and automobiles, and we still don’t really know what a destination is like until we’ve arrived. No matter how many photos you view, it’s always a surprise when you walk into the hotel lobby and take it all in. Sphere teleports you there virtually, so that by the time you’ve begun your voyage, you know you’ve chosen the right destination. Imagine you’re a travel company like a hotel chain. Virtual walkthroughs can give your prospective guests the confidence they’re seeking. Exploring your property in 360º, on their own terms, is a very empowering experience. Research shows that it leads to a 10X boost in time spent on your website and a 67% increase in conversion. The problem is that this type of offering typically costs $5,000 – $25,000 per location. So what options do you have? You need an affordable virtual tour service that yields high quality results. What’s more, you need procurement to be extremely easy since your already busy property managers will be the ones inheriting any new photographic duties. In Sphere’s quest for a solution to this industry pain point, we found that the perfect solution required more than just software. 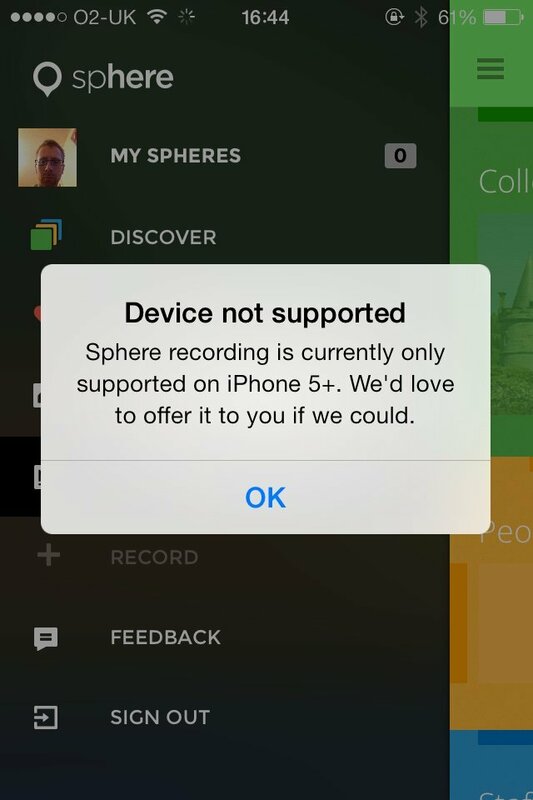 By teaming up with Kickstarter–backed Motrr, we’ve been able to deliver a tailored spherical recording technology that controls Motrr’s robotic iPhone dock (called “Galileo“). For property managers, the process is as easy as tapping “Start” and walking away. Suddenly, anyone can produce beautiful, HDR virtual tours — and have them published online — in three minutes. As a hotelier, you’ve just been given a solution that your property managers can run with, using nothing more than their cell phones, a free app, and a $150 device. The results are virtually indistinguishable from pro services, available almost instantly (instead of taking days or weeks) and at a fraction of the price. You win. Your property managers win. Your customers definitely win. And those two startups who believe in collaboration…they also win. It simply DOESN’T work. Crashed many times. Couldn’t get it to work once. received my Bluetooth Galileo today to use with my ‘compatible’ iPhone 4s. I think if you have a iPhone 4s you have to buy the 30 pin version, to get sphere to work?? It seems the iphone 4s can’t use it’s bluetooth connection to control the bluetooth galileo… but I don’t know why?? Box says it should have a iphone 4s insert to hold the phone. So I have No way of holding my iPhone 4s securely. So while i wait for Motrr to resolve this I can just about squeeze the iphone into the iphone 5 holder and test the unit… but I can’t do any serious captures. Although this is probably a shipping error… it’s frustrating that I can’t properly play with my new toy and it doesn’t inspire confidence in Motrr. Thanks for sharing Charles ! teleports you there virtually, so that by the time you’ve begun your voyage, you know you’ve chosen the right destination.